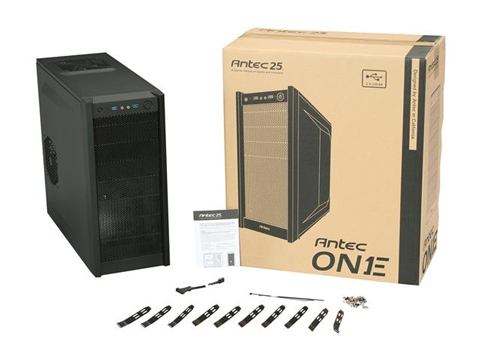 From new builders to seasoned system integrators, everyone will find something to like in Antec's One. This enclosure is stocked with features any builder will value at an attractive price - ample cooling, USB 3.0 port, tool-less 5.25" & 3.5" drive bays, and bottom-mounted PSU intake with air filter - so that you can put your PC together with ease and get to the fun stuff. If you're looking for high quality PC essentials at an affordable cost, then this enclosure is the One for you. Maximum graphics card length: 10.5"
17.20" x 8.20" x 19.20"
Pros: Tool-less, motherboard fit great, SSD and HDD are in a nice organized cage, ATX PSU fits like a gove in the bottom. Cons: When motherboard is installed its difficult to get fan wires behind motherboard. Other Thoughts: Case could use little longer motherboard standoffs. Pros: Fits a full ATX motherboard. Barely. Cons: Case weighs almost nothing, and is just a little more structurally sound than folded aluminum foil. Power supply can be mounted in only on orientation (fan down). Drive bay covers fall out. Internal 3.5" drive bay slides are cheap and have to be held in place, while squeezing and manipulating them, to get a drive into the slot. Expansion slot covers are pry out, non-reusable, and next to impossible to remove without damaging your motherboard. 5.25" tool-less drive bays are fairly useless; but at least there are still screw holes to securely mount your drives. Motherboard butts right up to the rear of the 5.25" drive bays; if your drive or 5.25" device extends further than the end of the bays, you're going to have a bad time with a full-length video card and / or a ATX motherboard. The included hardware is horrible. The screws strip out in a CD-ROM drive, and there aren't enough stanchions to fully populate all the mount points for a ATX board. Other Thoughts: Long and short, don't buy this case. Drive bay covers come out easily. Filter below power supply, good if you mount to pull in from bottom instead of inside. Drive bay sections have foam. You have to install standoffs for ATX board. That's silly since I guess most people will install that size, otherwise they'd get a smaller case. Other Thoughts: Front panel comes off fairly easy but uses simple pressure fit plastic prongs that can break. Mine came with one broken. I didn't find loose piece in my work area so I believe it arrived that way. It didn't fit just right, was probably forced on at factory. Front panel items are fastened and glued in place you cannot easily disconnect them to fully remove the front when connected to the board. Hard drive mounting is longways across the front with connections facing the right side. This is awkward if you frequently change drives but it's good for cable management. Tool less mounts work well. Indicators are small, a pin hole with LED behind. Power LED is bright. I think I'll modify this, I like larger indicators. My motherboard (MSI B350 PC mate) has a heatsink that prevents use of the top mounted fan, so beware. Even with the slight bump out on top there's very little clearance above the board. I moved it to the front where it mounts easily with 2 provided long screws. Be careful if you do this as it is very easy to over-tighten and break your fan. I wish it came with either a USB2 or 3 panel for the rear. Bottom feet are a bit more than 1/2 inch, seems good enough for air flow. Half height bay at top could be useful. Front panel audio wires are not long enough to reach bottom edge of motherboard easily. Ample number of hardware pieces. Overall it's good and I would choose again. I've always been happy with Antec and despite some shortcomings this is not an exception. Flimsy material....don't sneeze on it...you might dent it. Other Thoughts: It would be nice if they were to mention the fact that it only fits short cards....waste of money. Newegg's service, price and delivery. Hardware, first class, brass stands and plated screws. Plenty of room behind the motherboard tray for psu unused cables. Tie downs, enough. Will support up to a 58mm tall cpu cooler. Looking at it, resembles one of my 300-2 cases. Might fit inside it. USB 3.0 or 2.0 convertible cable to the board. Very organized with the hard drive bay on the bottom, access form the back. Data and power cables out of the way. Includes a SSD mounting bracket within. Cons: None, just a little information. One front bay for a 120mm fan. No dust shield. Nylon hose cut to size of the screen in front, sewn to the cross bars inside cured this. My Mrs. helped. Seeing that optical drives are almost a thing of the past, I elected to mount a 140mm fan in this bay. It is foam filtered at the front. Not sure if I would put a full size of today, ATX mother board in it. Might be just a little over crowded. Other Thoughts: Like the case very much. Had one, several years ago, someone wanted it with the system in it. I let it go. Installed a H97 board in this with a new 4th generation i7. It smokes! Runs very cool all day long. - So many 3.5"/5.25" bays and the 3.5" mounting system is nice. - Black interior looks great and overall the case is very slick looking. Cons: - No case fan filters is really not cool (just the power supply fan filter). What is ridiculous is they clearly designed the front panel for a filter (it has the tabs) but then just didn't include it. The 302 has a front filter. - Front panel is captured to the case. This means when you have the front panel off it's basically dangling in your way at all times. I will say this leads to a cleaner front I/O since it's integrated directly to the front panel but the trade off is not worth it. - Front panel pin-tab design is very frustrating. One tab came broken with my case (see below). The front panel is difficult and scary to get off because those pin-tabs are so fragile as you try to find a delicate balance between getting the panel off and breaking those tab pins. The 302 has a stronger tabs which you push from the inside to remove the front panel. - The USB 3.0 header has an ugly built in USB 2.0 header off to the side. It looks like early builds had an adapter included (as per the video on this case from LinusTechTips) but now they have an ugly plug just hanging off the side. - Front fan mounting and position is not optimal. You have to use these long screws, and there are only two of them. It looks like two could fit in that area but instead it's just one with metal blocking the rest of the frontal area. Again, the 302 has spots for two case fans up front and less weird mounting. - Room at the top of the motherboard tray is tight with the top fan. I actually had to remove the top fan to plug in my CPU fan and also take the board back out to route my CPU power from behind the motherboard tray. - 2.5" mounts aren't great. One is just tucked up in the 3.5" bay and another is just on the floor of the case. I would love to see some kind of 2.5"/3.5" combo mounting system in that cavernous 3.5" bay area. - The area behind the motherboard tray does not have a huge amount of space for cables. I was unable to route my 24 pin cable behind the motherboard tray. Other Thoughts: I am giving a solid 4 stars because this is a good case with a few major flaws. My front panel arrived broken and Antec support sent out a new one right away. 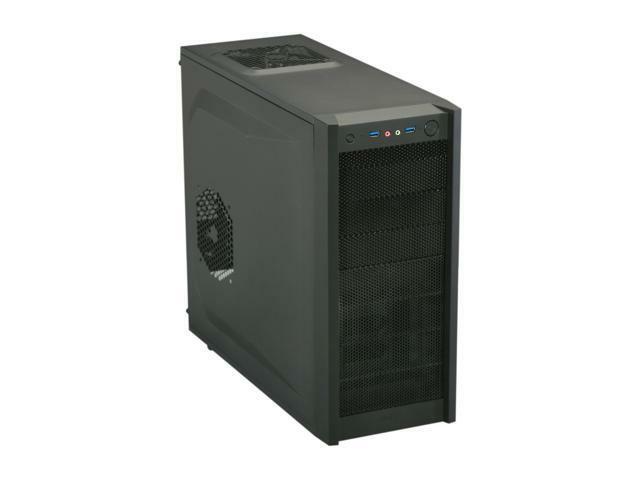 However, with the Antec Three Hundred Two only about $13 more (at time of writing) I would have sprung for that case had I done my research. Pros: Nice looking, compact little unit. No dents in it. Top fan is helpful to draw out heat. Front panel pops off easy. Take out one screw and all wires come out with front panel. Sufficient option for cable management. Acceptable delivery time. Big cut out for back plate access. Cons: Not really meant for larger cpu coolers. Even with top fan out, very tight for large cpu cooler. Could not get one in. Would be nice to have one more inch at top for large cpu cooler. Experienced problems with a few case standoff holes and with threads on stand offs stripping out. Other Thoughts: This unit is sufficient for basic, smaller cpu coolers and for micro/mini boards. This unit is to expensive for its quality. 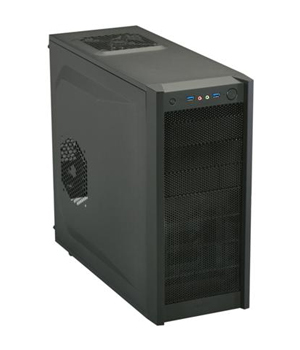 This case does not meet my needs due to lack for larger cpu coolers. Drive(s) cage is riveted in. Good box for basic build. Other Thoughts: Yeah, I love this case for the price.